Is your love for Chinese food sabotaging your resolution to eat healthier? Then I’ve got some good news for you! 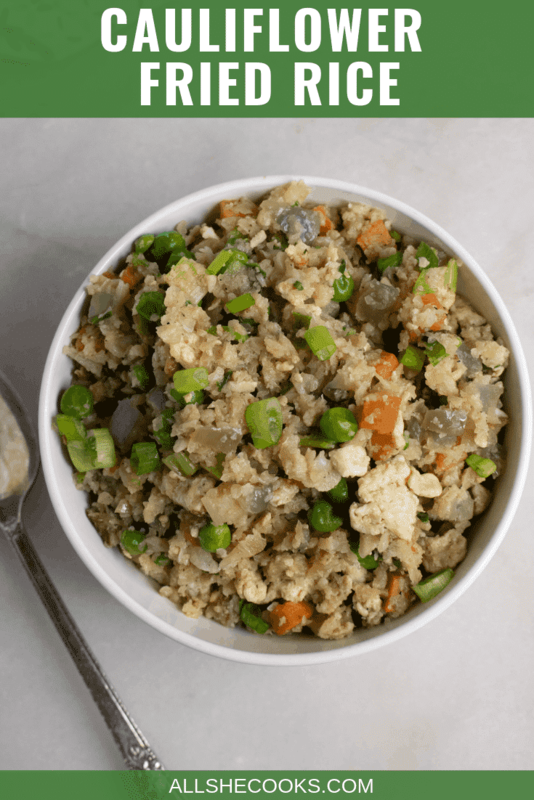 This awesomely tasty Cauliflower Fried Rice Recipe is the answer you’ve been searching for! Riced cauliflower has taken off as the healthy, low-calorie grain-free alternative to traditional rice. It lends itself perfectly to creating a healthier version of my all-time favorite Chinese food choice, fried rice. I am so relieved to have found an amazing substitute that allows me to still eat healthily and indulge my love for fried rice. It’s definitely the little things in life that make me happy. You will love the outstanding flavor in this recipe! It is amazing how sesame oil really boosts the Asian flavor and flair in any recipe it touches. Add to that some soy sauce and two different types of flavorful onions and you will literally be saying, “mmm, mmmm!” while you are eating this Fried Cauliflower Rice. You will also be thrilled with how easy it is to whip up this recipe! When riced cauliflower first hit the scene, you literally had to “rice” it yourself. But now, just look in the freezer case in your local grocery store to find riced cauliflower that is ready to cook. And while at the freezer case, grab the peas and carrots that you will simply open, measure and dump in the recipe. Then all that’s left to do is dice some onions and stir fry it all together and you have a delectable serving of fried cauliflower rice. 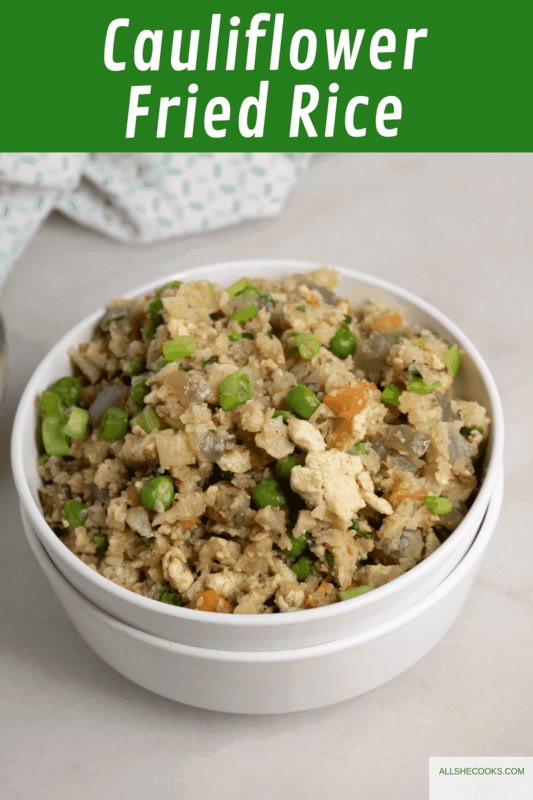 You will love this Fried Cauliflower Rice recipe because you can enjoy each and every delicious bite, totally guilt-free! Although you might scratch your head wondering why it took so long for someone to come up with the brilliant idea of substituting cauliflower for calorie-laden rice. The other ingredients are healthy, too. The partial use of egg whites, along with one whole egg keeps all of the flavor but cuts down on the fat and cholesterol. So, take another forkful and enjoy! Beat the eggs and then pour them into the skilled. Cook, stirring a couple of times. Once eggs have finished cooking, add in the onions and cook for an additional 3-4 minutes. Add in the cauliflower rice and the peas & carrots, and the soy sauce. Give it a stir, and then cover. Cook for 5-6 minutes before removing from heat to serve. 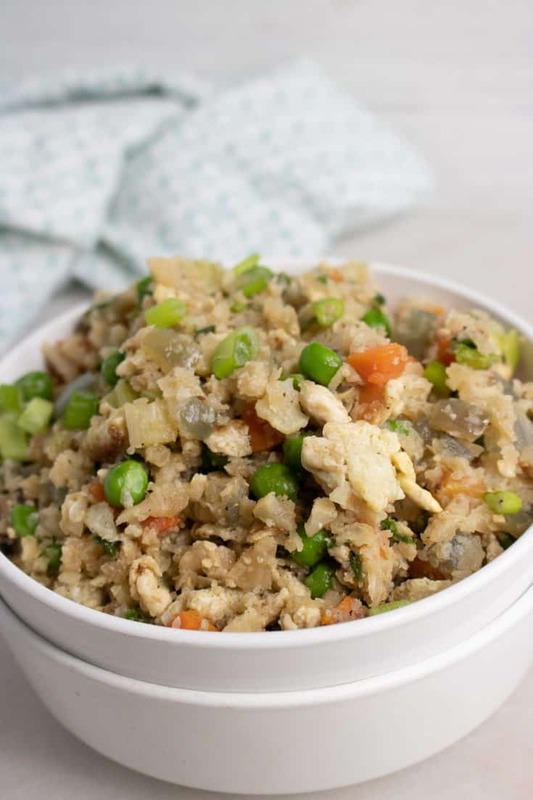 If you’ve fallen in love with Cauliflower Fried Rice, then you have got to try these delectable dishes, where healthy and versatile cauliflower is the star of the show! This recipe for Cauliflower Fried Rice lets you indulge your Chinese food cravings, guilt-free! Add in the cauliflower rice and the peas & carrots, and the soy sauce. Stir and then cover. Cook for 5-6 minutes before removing from heat to serve.